A quick overview of the company behind Call of Duty and World of Warcraft. Activision Blizzard (NASDAQ:ATVI) is the largest dedicated video game firm in the world. Its franchises, which include Call of Duty, World of Warcraft, Skylanders, and Candy Crush Saga, dominate their respective genres, and are among the most commonly played. In addition to being larger, it's more diversified than its closest competitor, Electronic Arts (NASDAQ:EA), generating significant revenue from all video game platforms -- console, PC, and mobile. Its stock has had a strong run over the last five years, rising nearly 200% and outperforming the broader S&P 500 by a factor of nearly four. In the next five minutes, you'll gain the knowledge needed to assess the company and the trends affecting its business. Activision Blizzard is driven almost exclusively by the sale of its video games, but it's more complex than that. Recent technological breakthroughs, including the growing popularity of online gaming and digital distribution, have complicated the video game industry. Activision Blizzard is really three companies rolled into one: Activision Publishing, Blizzard Entertainment, and King Digital. Each firm is a video game giant in its own right, with extensive operations on a number of platforms. Activision is wed primarily to the video game console business, though it also releases some of its games on PCs, smartphones, and tablets. Its key franchises are Call of Duty, Skylanders, and Destiny. It develops some games through wholly owned subsidiary studios, while others are contracted through independent developers. Treyarch, Sledgehammer Games, and Infinity Ward are wholly owned subsidiaries of Activision, for example, and take turns creating annual Call of Duty installments. Destiny, however, is developed by Bungie, an independent studio formerly known for the Halo franchise. Blizzard develops and publishes its own games mostly for the PC, but also for mobile devices, and at times consoles. World of Warcraft is its most significant product, but it also regularly releases games from the Starcraft and Diablo franchises. Later this year, it will release Overwatch, a team-based shooter based on an entirely new intellectual property. Activision Blizzard completed its acquisition of King Digital earlier this month. King is strictly a mobile developer, whose key games include most notably Candy Crush Saga, and also Bubble Witch Saga and Farm Heroes Saga. Unlike Activision and Blizzard, all of King's games are free-to-play, monetized through optional microtransactions. Activision and Blizzard both offer some free-to-play games, but most of their games retail for set prices. In addition to those microtransactions and the actual revenue generated from game sales, Activision Blizzard collects money from subscription fees (most World of Warcraft players pay around $15 per month) and the sale of add-on digital content. Call of Duty players can, for example, purchase optional map packs throughout the year to ensure their playing experience doesn't become stale. Activision Blizzard sells physical goods in the form of video game discs, but also smart toys. Its Skylanders series pioneered the toys-to-life category, where physical action figures can be used in conjunction with the digital game. To date, sales of these figures have exceeded $3 billion. Last year, Activision Blizzard generated $4.6 billion in total revenue, and King had been on pace to generate around $2 billion. In 2016, the combined company is expected to rake in about $6.25 billion on an adjusted basis. The addition of King should help Activision Blizzard further diversify its revenue streams, and ameliorate its reliance on marquee titles -- in 2014, Call of Duty, World of Warcraft, and Skylanders accounted for more than two-thirds of the company's net revenue. It should also help diversify its platform base. Last year, less than 10% of Activision Blizzard's revenue came from mobile platforms -- that should jump to about one-third this year. Activision Blizzard's growth prospects generally center on trends affecting the larger video game industry, and its games in particular. The size of the video game market has grown dramatically over the last few decades, and is expected to continue growing in the years ahead. In 2015, PwC projected that the global gaming market would grow at a rate of 5.7% per year through 2019, ultimately reaching $93 billion in the process. Activision Blizzard faces competition and opportunity within that market -- Electronic Arts' Battlefield series, for example, competes with Call of Duty for the interests of shooter fans; King's titles compete with many other free-to-play mobile games. But Activision Blizzard, as a firm, could become more complex in the years ahead -- transitioning from a pure video game-maker to something resembling an entertainment conglomerate. In recent months, Activision Blizzard has made major hires from the movie and television industries, and has created its own film studio. Activision Blizzard intends to use its video game franchises to create successful television series and films in the years ahead. Later this year, Skylanders Academy, an animated TV series based on the game, will make its debut, followed by a Call of Duty film sometime thereafter. These projects could eventually contribute significant revenue. Activision Blizzard is also working to create an esports business, where professional gamers play its games in front of a live audience. Tournaments of some of its games, including Hearthstone, have been broadcast on ESPN. Activision Blizzard is profitable, and can be valued using traditional metrics, including price-to-earnings ratio on both a forward and trailing basis. 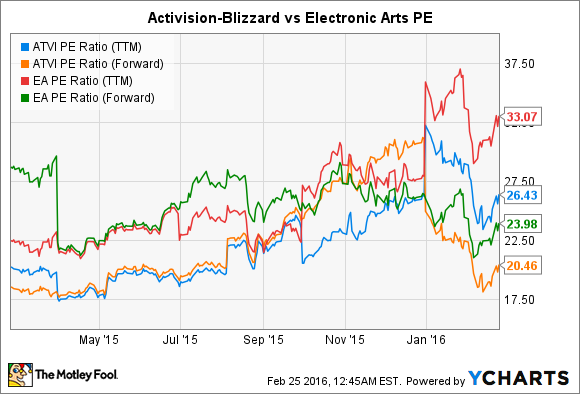 Activision Blizzard currently trades at a slight discount to its closest peer, Electronic Arts. Both firms are moderately expensive stocks, with trailing P/E ratios above 20, but given the growth prospects of their industry they aren't unreasonably priced. With its growing diversification, and potential avenues of expansion, Activision Blizzard is a solid stock for anyone looking to add exposure to the video game industry to their portfolio.